Kiwi Steel was established in 1989 to meet the market’s need for a steel trading and merchant company that could provide superior customer service with top quality products. Kiwi Steel operates as an international steel trader, broker, processor and merchant with the core business services of indent, stocking and processing. Kiwi Steel has the capability of handling a wide range of products including plate, coil, sheet, wire, and long products. Kiwi Steel offers a comprehensive range of processing services, including shearing, rolling, slitting, blanking and recoiling. Kiwi Steel’s core activity in New Zealand is the supply of product to manufacturers of household appliances, civil engineering constructors, and the building industry. Owned and operated by skilled steel industry professionals, the company has a wealth of knowledge and expertise that is second to none. 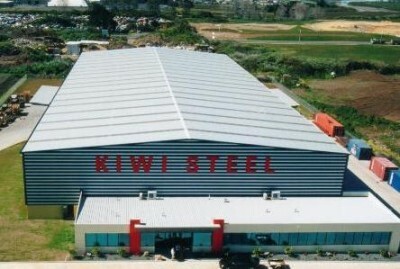 Here at Kiwi Steel, quality and service are the paramount values of our business. Sourcing only from world class mills which have a history of standing by their products’ performance, Kiwi Steel places the utmost emphasis on ensuring only the right materials are supplied for customer requirements. Kiwi Steel puts relentless effort in ensuring that every product sourced from overseas is properly tested and meets the appropriate standards prior to supplying the market. Kiwi Steel was founded to offer a ‘hands-on’ service and provide a better deal for the New Zealand steel industry, and this ethos still drives the company today. We take a proactive approach, ensuring constant communication with customers and striving to serve their individual needs in a timely and cost-effective manner. The security of our long-term relationships with all of our stakeholders including customers and suppliers means that Kiwi Steel will have a continual, long lasting presence as a leading steel supplier in the market place. Kiwi Steel recognises that integrity plays a crucial role in any business relationship, and a strong vision that is shared by all staff are key elements to shaping our view of the future. We acknowledge that the world is constantly changing: attitudes change and new ways of doing business are continually created. This inevitably brings new opportunities to add value in different ways. We look for these opportunities and with a young, fresh team, we believe that Kiwi Steel is more prepared for the future than any of our competitors.